It's official: Reactions to the Truth about Evolution have hit rock bottom. Some of you might be familiar with Joseph Mastropaolo. He published a paper in CRSQ called "Evolution is lethal antiscience," wherein he argued that the human race is going to die out in a matter of decades because of harmful mutations. It spurred a surreal debate in the letters to the editor, which I truly lack the words to describe. I was stupefied by the whole affair. In recent years, he seems to have given up on publishing papers in creationist periodicals and instead has turned his attention to developing his own website, www.josephmastropaolo.com. Since my original post on The Truth about Evolution, I'd say the biggest issue that has come up is what this evidence for evolution actually is. I've heard people casually dismiss me as ignorant and uninformed. Sure, I can see that. I've only done graduate studies in evolutionary biology, wrote a dissertation on protein evolution, worked and published in the field of comparative and evolutionary genomics, taught "History of Life" for three years, and irregularly attended SMBE and SSB conferences for the last twelve years. What could I possibly know about evolution? Having read over your coverage of baraminology, I'm left somewhat confused about how fossils fit into the picture. You appear to accept the existence of transitional forms (e.g., feathered theropods), but make no attempt to account for them. If they bridge the morphological gap between baramins, does this not pose a certain problem for your model? First I want to remind everyone reading that I do not treat this blog as a real publication outlet. It's a soapbox. That's it. If you really want a careful exposition about various issues, you'll have to check my books (see right) or my published papers, many of which are online. So just because I haven't said much about something on this blog doesn't mean I haven't considered it. There's a new article on horse evolution in PNAS that made headlines last week (here and here). Frankly, I thought the study was oversold, since the results were consistent with previous studies by the same group (J Mol Evol and PLoS Biology). It emphatically has not"challenged one of the textbook examples of evolution -- the fossil record of the horse family Equidae over the past 55 million years." The results cover only the very recent history of Equus. It has nothing to do with the basic story of horse evolution throughout the Cenozoic. It's still a very interesting study though. I want to preface this by saying that I'm not a regular reader of World magazine. In fact, I know next to nothing about that publication. Every now and then (like now), I hear something about an article they published on creationism or ID. They recently published a piece about Stephen Meyer (naming him "Daniel of the Year"), and as part of that coverage Marvin Olasky wrote a short item called "War and Peace: Fighters of Darwinism Should Remain Civil with Each Other." I didn't read anything else in that issue, but that subtitle caught my eye. That's the view from my front porch. 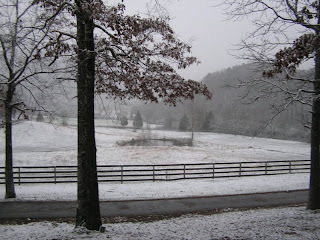 It doesn't snow very often here in my part of Tennessee, but it sure is nice when it does. You've probably noticed that I've slowed down on posting. It's that busy time of year again, and frankly, there hasn't been that much exciting to comment on lately. I'll probably have something next week on the maize genome. In the meantime, I hope you have a merry Christmas! The Center for Origins Research at Bryan College receives most of its support from the college, but our operating budget is significantly supplemented by external giving. That basically means that the college takes care of our salaries and gives us a place to work, but we have to raise about two thirds of the funds that we spend on our research and education projects. That's where you come in: Most of that money is donated by folks concerned about creationism and creation education. During this holiday season, I hope you will consider a financial gift to the work of CORE. You can donate online, or checks and money orders can be received at our mailing address. I know that the current economy is making money tight for a lot of people, but I do hope that some of you will find the work of CORE important enough to keep going despite financial hardships.